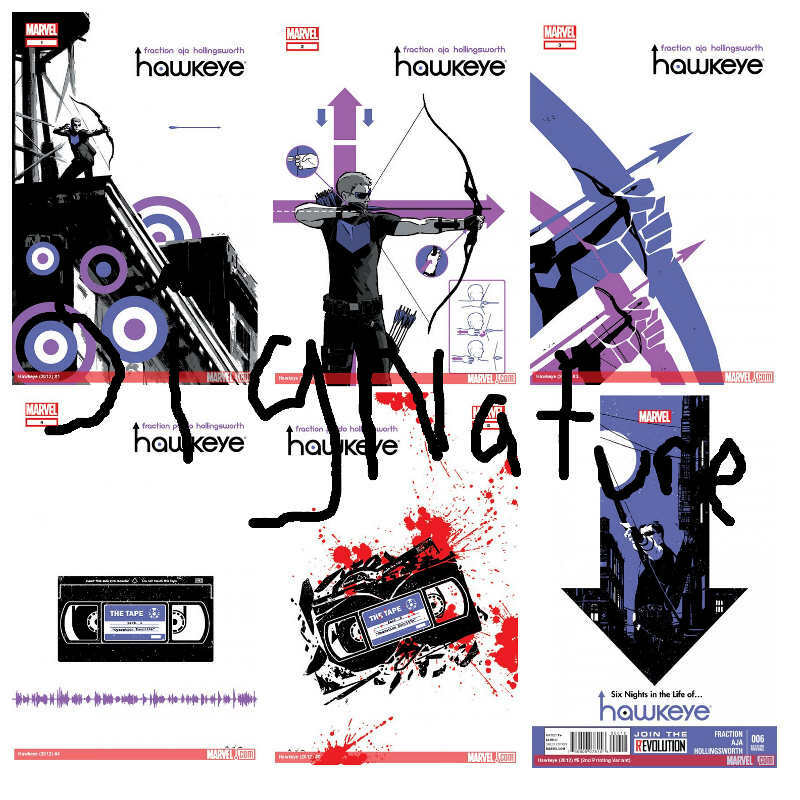 Here's my plan: Get Hawkeye 1-6 (and maybe 7-12) signed by Matt Fraction. Hang them on my wall. Bask in the awesomeness. 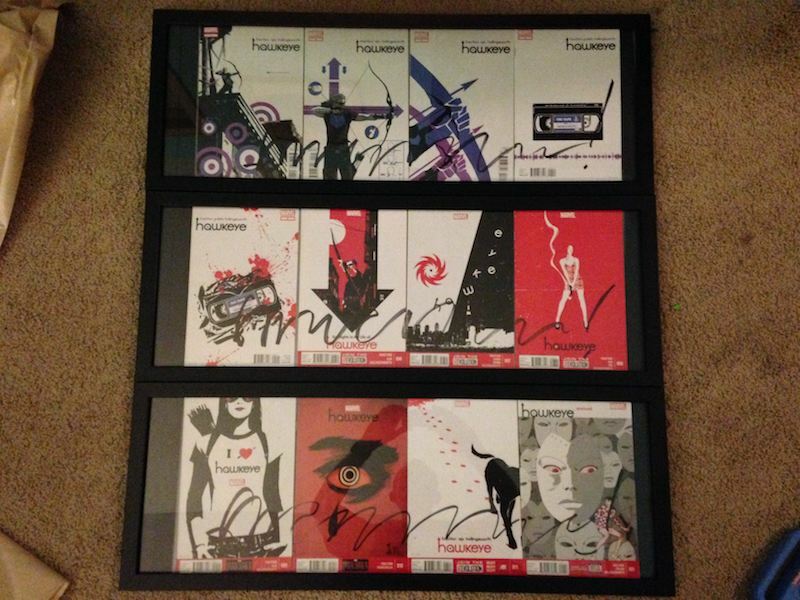 I can't think of a set that would look better framed in my office. I am going to try to set them up so he could sign all 6 with one huge swipe of the marker. 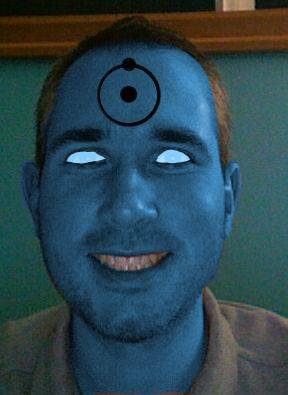 Here's an approximation of what it will look like. Ideally I will get 7-12 (the red issues) in a second frame. Issue 6 is red, but I will get the purple variant cover. outrageous. Pre-made 22x22in frames can be had for reasonable prices online. Even if I use a frame shop, I need a plan. 1. What should I put the books in? Poly bags with or without backing boards? 2. Should I have it matted? This would cut down on pressure between the book and the glass. reframe them at some point in the distant future. A good thing about this project is I can try some of this out with cheap old comics before the real thing. Basically, any advice on making this look as good and long-lasting as possible without spending an arm and a leg? Just to be safe, until I see more data I'm going to assume cancer causes cell phones. there is s post on here someplace regarding framing and displaying, i suggest you read it if you havent already. make sure the glass in the frame is UV protective and Acid Free. example $35 for your size. sag a bit when you mount them. seen. if possible find one from acid free plexiglass, or another material. this will give you a clean look with nothing between the covers. Thanks for the suggestion nisav! you know what, i overcomplicated it with the wedge...here is a much simpler solution. everything is the same, except get rid of the twedge and replace with "clear archival self adhesive acid free corners"
safely side by side with no drooping. and with this you can use a matte as well. Thanks Nisav! That sounds perfect! spacing might look a little less cool, but won't require me to learn any new crafting skills. looks cool, but there is no product info on that page...specifically materials the frame is made from or any specs on UV and so on. I think you should go with your first plan. It's super awesome and will be rewarding when you pull it off. collectibles, coins, sports cards, vinyl, etc. So hopefully it's quality stuff and they know what they are doing. It would be nice to have some UV-resistant glass. I may have some made at a future point. This will look so awesome in my office! I like the way the 3 frames make up a perfect square, an unexpected perk. Matt thought it was an awesome idea. I was going to show him a pic of the finished product the next day but didn't have time. Very nice Matt , I am sure it will look great in your office . Looks like Moderation has some sweeping up to do. Does this ever result in some kind of revenue for whoever is behind it? I mean does anyone actually look over these spam posts and think, "Hm, I'll try this out."? I always assume they are automated spam bots. Pretty annoying, and like 99.9% of all spam, just useless and ultimately pointless.